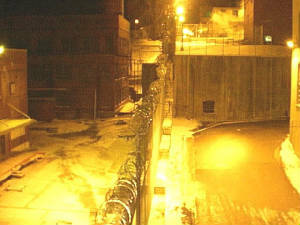 Photo taken of area just outside of the walls @ the ABO where UFOs and Aliens are very active. The photos above and below were taken @ the ABO on different nights outside the walls between tower #10 and Tower #11, where I had studied the UFO and Alien phenomena for several years. The photo below shows part of the wall, the outside road and the area where the rail road tracks were located. The small camera flash was not used for either of these photos. Others have chosen to identify this type of energy signature as a form of ghost energy. I can only say once again, that we need to get our act together. Call it what you will, this energy signature is from alien entities @ the Alien Base of Operations and I can only call it an 'Alien Energy Signature'. 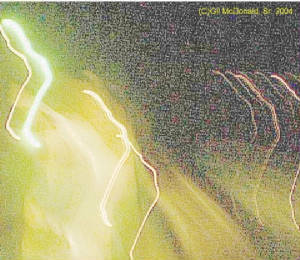 Others say that these are moving orbs that leave a contrail. I believe these things are made of a string of orbs and have nothing to do with a contrail. And my video confirms that where it shows a string of 5 or 6 or more items strung together (like a train) and flying thru the air. I have mentioned previously that I have filmed some orbs that have a blinking light. I have also seen humanoid / alien / ghost creatures that could produce a small light (similar to a very small flashlight) in the area inside of the mouth location. I used the ArcSoft Equalization process to bring out some of the details in this photo. The lower right section of the photo shows a long wall of cloaking material and there is no way for me to determine what is on the other side. An enlargment shows what appears to be a metal rack holding the cloaking material at the far end. It is only visible in the photo so I can't say that it is metal as we know metal. Once again, this is alien, not ghost. The aliens can make an image that may look like grandma but it is not grandma. It is totaly alien. I use the term 'ghost' only to let others know that this intelligent life form has been mis-identified as ghost and is correctly catagorized as alien and only alien. FIRST: While the sections of the shuttle craft were spinning just prior to departure I could hear a whirring sound that I would compare to that of a large electric drill. However, I should also mention that my hearing is not good. My left ear has lost about 90% of its capability & my right ear has lost about 50% of its capability. The largest loss of hearing seems to be in the high frequency range. I was 50 to 70 yards away from the shuttle craft & the whirring sound is what I could hear from that distance. Under good conditions I can still hear normal conversation without any problem; however, the ringing of a bell or chimes or the old type of telephone ringer is more difficult for me to hear & my left ear will not hear this type of high pitched sounds at all. So the sound of the shuttle craft spining surely would have been much more audible to a person with good hearing. Perhaps less like a large drill and more like an electric power generator. SECOND: Concerning the frozen image of the shuttle craft that was left after the departure of the shuttle craft; it was suggested by an acquaintance (with a better education) that the frozen image that fell to the ground with a loud 'plop' may have been frozen mosture in the air. In other words the action of the shuttle craft may have created an extremely cold temperature in the area within the force field. Thereby freezing the mosture in the air that surrounded the shuttle craft & the Royal Family riding on the top of the shuttle craft. After the frozen mosture image had warmed slightly (after the departure & cooling action of the shuttle craft) then the still slightly frozen mosture that composed the image fell to the ground with the 'plop' sound. This might also explain the 3D art work that I had seen some of the aliens do with steam (vented from heating systems in the buildings in this small industrial area) in the winter months. (See below) I only saw the art in the process of being formed from steam & for the few seconds that it stood. I did not see the aliens that were doing this art work. However, this 3D art work appeared to be done without the assistance of the shuttle craft. But the aliens would use the steam to make some beautiful, moving art that would fall to the ground after about fifteen seconds. It also would make a 'plop' sound when it hit the ground. I never knew when to expect it to appear. It was done & then fallen to the ground so fast that I could never get a photo. This would also explain the frozen moisture that seems to cling to cloaked UFOs as shown in my video where the cloaked UFO is flying over the prison wall at tower #5. The article below describes the one most beautiful, moving (living) work of art that I have ever seen, & it was done by aliens & I believe they did it for my enjoyment. I wanted to add these notes for the benefit of all but especially in the hope that there might be someone with scientific knowledge who is studying the photos & notes posted on this web site. We have a chance for some real scientific advancement. I can only hope that someone in the right position is paying close attention. I had seen the aliens do a couple of rough works of art previous to this occasion. One of those was a bird / man combination that was made flat on the ground like an indian sand painting. On the occasion described below the art was so stunning that I was not able to do much but appreciate its beauty & after it fell I was constantly bringing it back to mind so I could wonder at it again & again. I always wanted to get a photo of this beauty, but I never knew in advance when they were going to do this & it only lasted about 15 seconds before falling to the ground. They would do these works of art just below the spot where the shuttle craft was docked. In the cold weather the steam exhaust from the buildings would make huge clouds of steam & the aliens would capture these steam clouds, color them, & shape them into three dimensional,moving works of art. On this occasion they colored the steam clouds a deep purple. The first huge steam cloud rose from the pipe up to the roof level of a two story building, then it changed color from gray to a deep royal purple, moved over to a particular spot and then went back down to spread out on the ground. It took the shape of a beautiful pool about 12' long & 6' wide, complete with reflections of moon light & ripples in the water. Faster than I could write this the second large cloud had been colored the same deep royal purple and gone to the ground to make the figure of a very tall woman standing on the edge of the pool. She wore a long flowing dress, much like the classic style of old Rome. Her hair was shoulder length & styled beautifuly. Her face was beautiful & at peace with all things. She looked much like a very tall version of the 'Queen' that I saw on the 'Royal Tour'. She knelt by the side of the pool & dipped her left hand in the rippling, moon lit water. Then she brought her hand up to her mouth & took a drink while drops of water left her hand & fell into the pool below. Each drop caused moon lit ripples as it fell into the purple pool. It was all peacefulness, serenity & beauty. Then, it was over. All of the purple vapor fell to the ground. As the steam hit the ground it made the sound of a long, Plloopp. Normally steam is lighter than air & it goes up. This had already gone down to make the few seconds of art & when it fell to the ground making this sound, it sounded as if it had weight as if it were very cold (frozen) moisture or maybe heavy water. It was a beautiful moment. I applauded their work. Several times while working this area I had seen the colors of everything change. The buildings, the ground, the trees and every other thing would become a beautiful gold, or royal purple or emerald green. I have a few photos that show some of those colors. It also would only last a few seconds but it was beautiful to see every drab item in this area take on such beauty. Not long after this I could not get back into that area so I did some research for a few months from tower #5. But I will continue to treasure the memory of their beautiful 3D living art. Be sure to check the rest of my pages.